Ilyashev & Partners Law Firm headed the Chambers Global rating in the field of dispute resolution in Ukraine, for the first time becoming the only Band 1 firm in this practice. According to the survey conducted by Chambers Global 2019, published on 14 February 2019, the Senior Partner Roman Marchenko (Band 1) and Managing Partner Mikhail Ilyashev (Band 2) received personal recommendations. Sources describe Roman Marchenko as a “business-oriented and very balanced” practitioner, with one interviewee also pointing out that he “delivers high-quality products”. He regularly acts as a litigator and arbitrator in international and domestic disputes. Managing partner Mikhail Ilyashev is noted for his domestic litigation experience, regularly providing strategic advice on firm’s key mandates. He regularly acts on debt recovery cases, and is also experienced in intellectual property disputes. Dispute resolution is a key practice area of Ilyashev & Partners. Every year the firm provides legal support and counseling in more than 500 litigations. 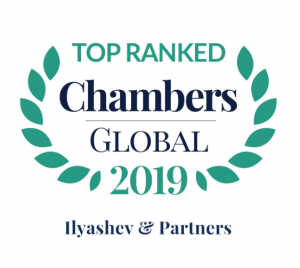 Chambers Global, Chambers Europe and The Legal 500 – EMEA have been recommending Ilyashev & Partners as one of the leading law firms in Ukraine in the field of dispute resolution over the years. According to the survey “50 Leading Law Firms of Ukraine”, in 2018 the Firm provided legal advice in over 40% of major public litigations and arbitrations. Managing Partner Mikhail Ilyashev and Senior Partner Roman Marchenko are internationally recognized as one of the leading lawyers in dispute resolution in Ukraine. For the first time Mikhail Ilyashev was included into the Chambers Global rating back in 2006, and Roman Marchenko in 2011. In 2018, Mikhail Ilyashev and Roman Marchenko were have been honorably inducted into The Legal 500 Hall of Fame as two leading lawyers in the field of dispute resolution in Ukraine. The partners of Ilyashev & Partners hold leading positions in the ratings of the best litigation lawyers of Ukrainian annual surveys “50 Leading Law Firms of Ukraine”, “Ukrainian Law Firms. A Handbook for Foreign Clients”, “Client’s Choice: TOP-100 Best Lawyers of Ukraine”. Mikhail Ilyashev is a two-time winner of Legal Award as the Best Litigation Lawyer (2012, 2017). Roman Marchenko is a winner of Legal Award as the Best Lawyer in Arbitration and the Best Litigation Lawyer (2014, 2016). Chambers Global is the leading international legal directory and was established in 1990 and now covers over 190 jurisdictions throughout the world.